This product is not available to either (i) current cardmembers of this credit card, or (ii) previous cardmembers of this credit card who received a new cardmember bonus for this credit card within the last 24 months. You will receive 6,500 Stars with this bonus offer. To qualify and receive your bonus, you must make Purchases totaling $500 or more during the first 3 months from account opening. ("Purchases" do not include balance transfers, cash advances, travelers checks, foreign currency, money orders, wire transfers or similar cash-like transactions, lottery tickets, casino gaming chips, race track wagers or similar betting transactions, any checks that access your account, interest, unauthorized or fraudulent charges, and fees of any kind, including an annual fee, if applicable.) After qualifying, please allow 6 to 8 weeks for bonus Stars to post to your account. To be eligible for this bonus offer, account must be open and not in default at the time of fulfillment. Rewards Program Agreement: For more information about the Starbucks Rewards Visa credit card rewards program, view the latest Rewards Program Agreement. We will mail your Rewards Program Agreement once your account is established. If you become a Chase Online customer, your Rewards Program Agreement will also be available after logging in to chase.com. At participating Starbucks® stores. Some restrictions apply. See Starbucks.com/terms for details. As a Starbucks® Rewards Visa® cardmember, you will receive eight (8) complimentary food or beverage items ("Barista Picks") as described below in each twelve (12) month period beginning 45 days following the opening of your account. Each Barista Pick is available as a coupon automatically loaded to your Starbucks Rewards account which may be redeemed for one (1) complimentary item at a participating Starbucks store as described in the terms of the applicable Barista Pick coupon. Substitutions and customizations are not allowed unless specifically permitted by the Barista Pick coupon. Barista Picks cannot be redeemed for cash or Stars. Each Barista Pick expires 30 days after it has been loaded onto your Starbucks Rewards account. If you have provided us with a current, valid email address, you will receive an emailed notice that the Barista Pick has been loaded to your account. One Barista Pick will be loaded approximately once every six (6) weeks. You must present your registered Starbucks Card to the barista at a participating Starbucks store in order to redeem your Barista Pick. 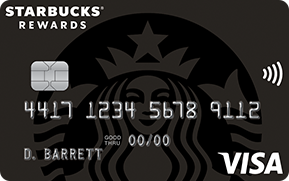 The Barista Pick benefit will be awarded as a single coupon valid for one-time use, regardless of the number of authorized user cards associated with your Starbucks Rewards Visa account. Please contact your service merchant for details on any fees that may be associated with paying your bill using a credit card. You must be at least 18 years old to qualify (19 in AL and NE) for a Starbucks® Rewards Visa® Card. Accounts subject to credit approval. Restrictions and limitations apply. Starbucks Rewards Visa credit cards are issued by Chase Bank USA, N.A. Offer subject to change.